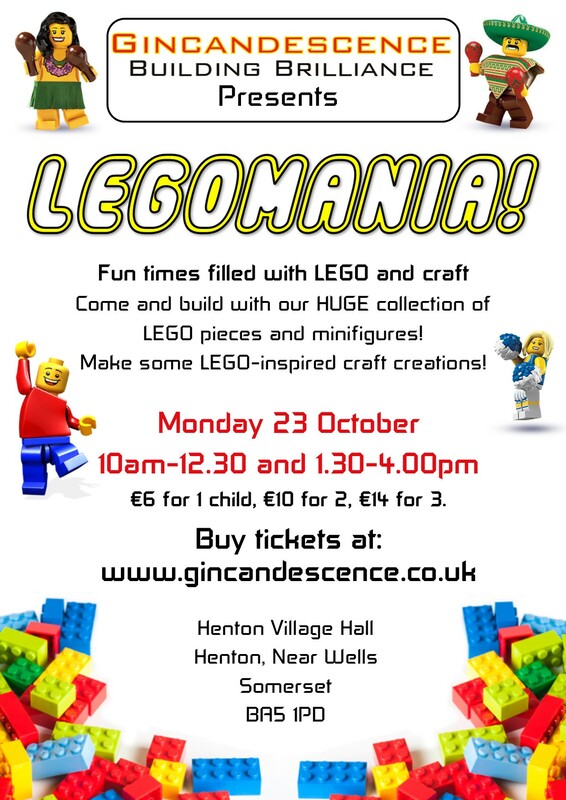 LEGOMANIA! is coming to the Mendips on Monday 23 October! We are really excited to be coming to this new venue in Henton, which is just a couple of miles outside Wells. 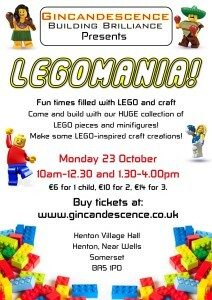 As for all our events we will bring our HUGE collection of LEGO and loads of LEGO related fun with Gincandescence. There will be plenty of LEGO for everyone to build whatever they choose. We’l also have lots of LEGO-related craft ideas, so that children can make something to take home. We will be running two sessions, at 10am-1230pm, and at 1.30-4pm. Children will need to be accompanied by a responsible adult. The LEGO is for use during the event and only the craft creations can be taken home. Please note: ticket transactions may appear on your bank statement as payments to V Gould Ltd or as ‘online transaction’.